Information availability is critically important in today’s fast-paced corporate world. The goal of PTS’ evaluation, planning and data center risk assessment services is to identify obstacles to and recommend solutions for redundant and fault-tolerant network & support infrastructure for mission critical environments. Our methodology combines the business and technology expertise needed to ensure customer satisfaction from concept through completion. PTS performs a comprehensive data center inspection to assess the ability of the support infrastructure to provide continuous availability including a site inspection, an evaluation of the present load condition, a comparison to the capacity constraints, identification of critical deficiencies and potential downtime risks, an assessment of the concurrent maintenance capacity of the site and recommendations for improvements. 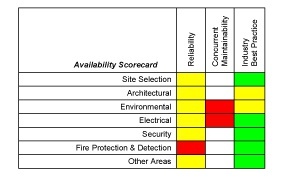 A comprehensive facility inspection to assess the ability of the space and support infrastructure to provide continuous availability including a site inspection, an evaluation of the load capacity constraints, identification of critical deficiencies and potential downtime risks, an assessment of the concurrent maintenance capacity of the site, a recommendations for improvements and a comparison to the identified business objectives for the intended use of the space. Finally, a cost estimate is generated based on the retrofits as required to meet the business objectives. Understanding your company’s own unique vulnerabilities is the foundation of an effective information security strategy. Working in cooperation with your staff, PTS experts conduct a thorough security assessment that precisely identifies both internal and external threats and vulnerabilities specific to your company. We then provide you with a detailed briefing of your current security posture as well as clearly defined recommendations for mitigating your risk. Armed with a vast knowledge of today’s diverse methods of attack and the security industry’s most effective technical tools, PTS offers you the unmatched expertise of world-class security professionals who know how to find security holes and fix them before any damage is done. PTS’ Data Center Availability & Risk Assessment services leverage the first three phases in the progression of the data center project process and data center lifecycle. Identify & inventory and rank IT assets based on criticality to the business. Rank the threats that pose risks to the critical assets. Identify the severity of vulnerabilities in the critical assets. Prioritize risks by focusing on assets affected by credible threats and existing vulnerabilities. Develop strategies that minimize risk and maximize ROI.